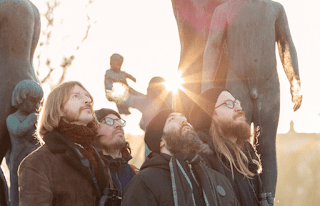 TUSMØRKE RELEASES TITLE SONG FROM UPCOMING ALBUM "FJERNSYN I FARVER"
Norwegian progressive folk rock four-piece Tusmørke return with a new album entitled Fjernsyn i Farver on May 4th, out via Karisma Records. The band has teamed up with The Prog Sphere for an exclusive premiere of the title song. Listen here: http://www.prog-sphere.com/specials/tusmorke-fjernsyn-i-farver-premiere/.